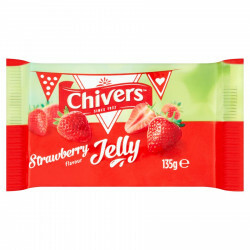 Make your own delicious bobbly dessert with the Chivers Strawberry Jelly! Chivers is the ideal preparation to make your own strawberry jelly, the typical Irish and English dessert. The Chivers strawberry jelly is low in calories: there are only 10 calories in one serving! William & John Chivers made their first jellies in 1873, selecting fruits from the family orchard. Chivers products are still produced locally in Drogheda, County Louth, in Ireland. 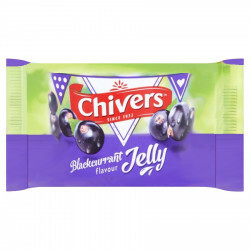 Chivers offers the finest selection of desserts, such as a range of delicious bake-it-yourself jellies. 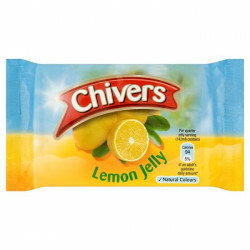 Make your own delicious bobbly dessert with the Chivers Lemon Jelly! 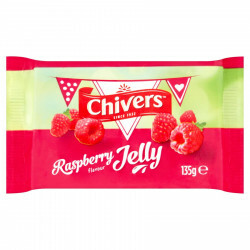 Make your own delicious bobbly dessert with the Chivers Raspberry Jelly! Make your own delicious bobbly dessert with the Chivers blackcurrant jelly! Ingredients: glucose-fructose syrup, water, sugar, gelatine (from pork), acid (citric acid), flavouring, acidity regulator (sodium citrates), preservative (acetic acid), colours (carmines, carotenes), strawberry juice from concentrate. Once made, consume jelly within two days. Instructions: It's so easy to make! 2.add 100ml of cold water and heat for approx. 1 minute (based on a 750 Watt oven). 2. Stir until completely dissolved and then pour in cold water up to the 570ml (1 pint) mark on the jug. 3. Pour into a mould, large bowl or serving dishes and refrigerate to set. Alternatively - place jelly cubes in a measuring jug. Add boiling water up to 285ml mark, stir until dissolved. The pour in cold water up to the 570ml (1 pint) mark n the jug. Refrigerate to set.